This cuddly brown, silver fox fur throw made with Scandinavian quality foxes offers you an idyllic living ambiance and makes your living room or bedroom even more comfortable. Convince yourself and enjoy this high-quality silver fox fur throw in your home! The silver fox skins are from Scandinavia, and they have very soft and silky hair. We always purchase our foxes for our silver fox fur throws directly from the SAGA Furs fur auction in Helsinki, Finland. 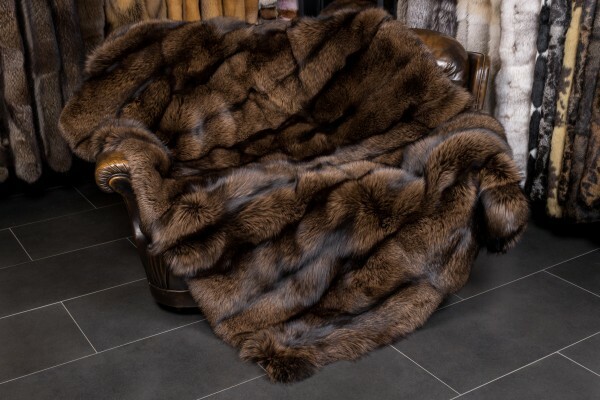 Related links to "Brown Silver Fox Fur Throw SAGA-Furs"
Customer reviews for "Brown Silver Fox Fur Throw SAGA-Furs"
It's so comfortable, love it very much! So far my husband and I love this brown silver fox fur throw a lot. The color is warm and wonderful. The fur throw is just heavy enough to provide you with the comfort and stress relief you need at the end of a long day. So pretty on our bed and so comfy and cozy you won't want to get out from under it! I gonna order more gifts in the Christmas time.